On being nice to spiders, gun control, and other hot topics. Don’t read this book to your children, unless you want them to turn out like me. When I was a kid, my dad used to read me this book called Be Nice to Spiders, which I’m told was one of his own childhood favorites. 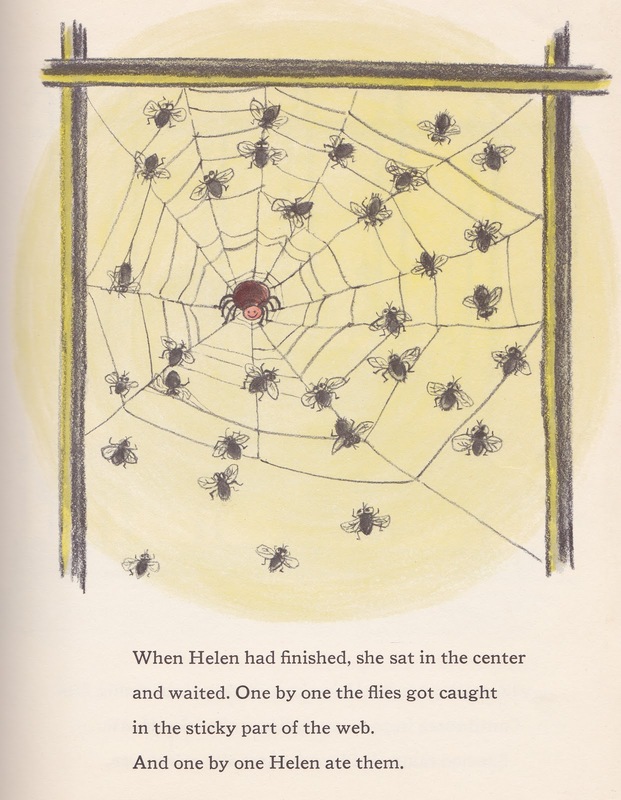 The book is about a spider named Helen who goes to the zoo and spins webs to catch flies, so all the zoo animals are happy, because everyone hates flies. Perhaps as a result of this story, I do not kill spiders when I find them in my house. Most of the time I just let them be, since I figure spiders are less annoying than those slow, stupid winter flies that buzz around and refuse to ever fully die. Sometimes if there’s a really big one I do the glass-and-paper trick where you trap the spider and take it outside. I never kill them. This practice, among other things, is what led to my nickname in college, Boulder Barbie. My best friend still calls me that, although she might change her mind once she sees this post. In keeping with my Boulder Barbie nature, I make it a habit not to kill things, even moths, which are disgusting and have no apparent purpose. I believe you shouldn’t eat things you wouldn’t be willing to kill with your own hands. (I’m a weenie, so I eat very little meat.) This is a common sentiment here on the Last Frontier, and I know a lot of people whose meat for the winter is killed in the fall and stored in their freezer for the months thereafter. With this philosophy in mind, I have become an “Alaska Vegetarian,” which means I’ll eat meat if I know the person who killed it. I realize that’s a little removed from my philosophy of didn’t-kill-it-don’t-eat-it, but I’m okay with that. Also, sometimes I cheat and eat whatever sounds good. I guess my relationship with meat is a confusing one. (Not Dar.) More on that later. 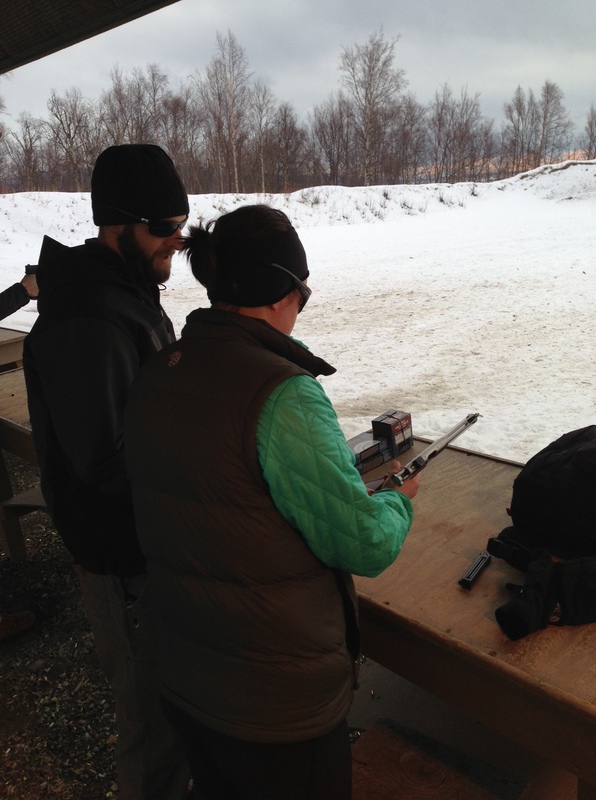 Anyway, before I moved to Alaska, I had no intention of ever shooting or even touching a gun. I think they are vile and awful and more likely to accidentally shoot your child or a pair of star-crossed lovers having an illicit affair than an intruder or a bear. I don’t like to see them and I don’t want to know if you own and/or are carrying one, and I certainly don’t want them in my house. I don’t like to kill things. I am decidedly anti-gun. Justin patiently explains how to load and fire the .22, which turned out to be remarkably less terrifying than I’d anticipated. On a scale of one to ten, I’d say my resistance to shooting a gun with Kevin and his friends last Sunday was at about an eleven. He presented the idea gingerly, sandwiched between two things I really like, one of which was sandwiches. It was a hard sell. “What should we do today?” he asked me, although he’d been secretly planning to trick me into betraying my bleeding heart values for several days. When I didn’t come up with a suggestion immediately, he pounced. Our friends were waiting for us. I had no choice but to bitterly eat my sandwich on the way there. Kevin’s friend Rachel and her husband, Justin, are way cooler than we are. They have splitboards, and they hunt and fish and can and preserve and all that kill-it-yourself stuff I was talking about earlier, and are just generally pretty NFA. Kevin makes it sound like their arsenal rivals that of Burt and Heather Gummer (Tremors? Anyone? ), but they didn’t bring anything too scary-looking to this particular outing, so I’ll withhold judgment on that. I’ll admit my lifelong aversion to guns had me a little anxious about the idea of shooting one. “Local idiot accidentally shoots friend, bystander at public shooting range,” I pictured the headline would say the next morning, “Ironically, shooter was apparently staunchly pro-gun control.” It didn’t sound good. But I had this thought. Lately, I’ve been sticking my fingers in all kinds of different pies, figuratively speaking, hoping to fool people into thinking I’m tolerable enough to invite on various fun trips. Each time, a different skill I’ve never really had to utilize before has been required of me. I’ve been lucky so far—Can you ski? they’ll ask, How about underwater basket weaving?—but it’s getting tougher to keep up, and it’s only a matter of time before the only thing that stands between me and the most epic backcountry experience of my life is the ability to shoot a gun. With this philosophy in mind, I figure you can never know how to do too many different things. Feeling proud of myself for having made the decision to saddle up, I picked up Rachel and Justin’s .22 and examined it carefully. It was not the killing machine I’d imagined, although I did flinch when an actual redneck, two benches over, fired a gun that looked like he’d gotten it from the Oriental Trading Co. catalog, where it was advertised as “Yosemite Sam’s Gun Replica—A Looney Toons Exclusive! !” He shot it one-handed, standing sideways and with the other hand on his hip, the way you’d shoot if you were in a barfight at Klondike Mike’s. I guess he gets credit for practicing pre-drunken stupor. There’s probably a line somewhere between my shakily firing the .22 in the general direction of the target and Rooster Cogburn flying across the field, reins in his teeth, a gun in each hand, shooting wildly at anything that moves. The Boulder Barbie way is (debatably) safer, but infinitely less Gritty. I guess it’s a tradeoff.